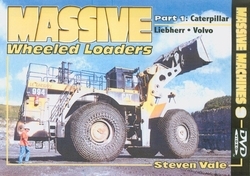 The first of two DVDs on top-of-the-line wheel loaders presents the Caterpillar 988H, 992G, 993K, 994 and 994F, Liebherr L586 and Volvo L350F in action in Italy, England, France and Belgium. Special coverage is given to their use in handling marble blocks, along with a history of the marble quarries of Carrara, Italy. Cat, Dresser Haulpak 445E and Unit Rig haulers are also featured, along with the Liebherr R954 backhoe. Playing time approximately 75 minutes.